AFP: World dignitaries laid to rest former UN secretary general Kofi Annan in his native Ghana on Thursday, with calls to keep alive the legacy of a “stubborn optimist” to create a better, more peaceful world. His widow Nane Maria led hundreds of mourners, including world leaders past and present, traditional rulers and global royalty, and called her husband an “extraordinary” person who had a “joy of life”. “My love, you are now back home where you started your long journey. 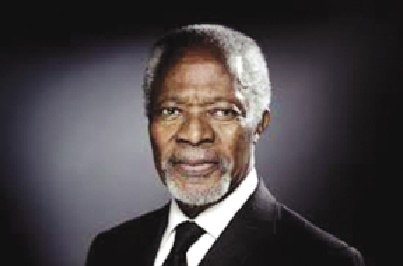 But may your wisdom and compassion continue to guide us, wherever we are,” she told his funeral in the capital, Accra. “The greatest tribute we could ever pay is to follow his example,” he added to conclude a three-hour ceremony of tributes, prayer and song. Ghana’s President Nana Akufo-Addo called him “one of the truly iconic figures of modern times”. “We lost a brother, a husband, a father, a grandfather and an uncle, a man of deep conviction who was as committed to instilling the values of fairness, integrity, kindness and service in each of us as he was to advocating for peace and human rights around the world,” he said. Current UN Secretary General Antonio Guterres praised his close friend as an “exceptional global leader” who was dignified, courageous and a man of “integrity, dynamism and dedication”.